Marion Frances Eisele, 83, of Olathe, KS passed away on December 6, 2016 at Avonlea Cottages Assisted Living. She was born on December 15, 1932, in Kansas City, KS to Frances Raymond and Alice (Hankinson) George. On February 11, 1955, she married Clyde L. Eisele, and they made their home in Olathe. Marion owned and operated her AVON business for 46 years. 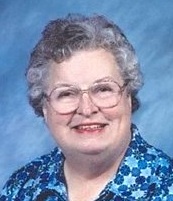 She was a long-time member of the First Baptist Church of Olathe. She enjoyed selling Avon, Johnson County Old Settlers Days, Olathe Night at the Royals, playing bingo, and she loved spending time with her grand-daughter and grandchildren. Marion is survived by her daughter, Marilyn F. Brown, her son David Eisele, her grand-daughter, Mindi (Eric) Nelson, her great-grandchildren Malaki, Ethan, Harlee and Ryker, and her brother, Ray George. She was preceded in death by her husband, Clyde, her parents, and her son-in-law, O. Lynn Brown. Visitation will be held on Sunday, December 11, from 5:00-7:00pm at the First Baptist Church of Olathe, 2024 E. 151st Street, Olathe. Private burial in Aubry Cemetery.